Your marriage isn’t working - you respect each other but have drifted apart over the years for whatever reason. Now you and your spouse have decided to divorce and close this chapter of your lives. You’ve heard the stories and perhaps witnessed a few horrors through friends or family who have divorced; that doesn’t mean you need to have the same experience. If your definition of amicable is “we want what is best for ourselves AND for each other” – then you are well on your way. What do you do next? How do you “break up” after years together? Do you need separate attorneys? Is mediation or a collaborative divorce an option? Divorce can be complicated, but that doesn’t mean it needs to be antagonistic. You and your partner wouldn’t be getting a divorce without having seriously thought about it. The key is mutual respect and focusing on the now and what you agree on, versus the past and what you disagreed on. And while it is almost impossible to keep emotions out of it, that doesn’t mean you need to have a knock down drag out “War of the Roses” nightmare. Focusing on agreements rather than disputes can reduce the combative nature of divorce. Explain to family and friends how you plan to move forward and how both of you want to be supported through this time. What is our main uniting focus? Is it our children? What does a “successful divorce” mean for each of us? What do we agree on? There are many financial consequences from a divorce for both partners, especially when one partner is a significantly higher wage earner. Resolve to keep money out of arguments (don’t use it as a weapon). Fairness can have different definitions depending on the person. The key rule for dividing your assets is to be equitable, not necessarily equal. In an amicable divorce, you do not want to leave your partner without the resources and financial support to get back on their feet. If you have children, divorce is more complicated both emotionally and financially. There are many financial issues that come into play with children depending on the age of the children. If you have college-age children, you’ll need to decide who will claim them as dependents on tax returns. This can affect financial aid and also your personal finances. Is it more equitable to alternate years? If you have younger children, childcare and custody need to be taken into account. Putting what is best for the children first, both financially and emotionally, should be your shared goal. As you decide on how to separate assets, you’ll need to determine your net worth and how assets are titled. As a couple, gather all your financial paperwork tax returns, retirement plans, investment accounts, wills, trusts, real estate holdings and any other financial records you and your spouse have from the last five years. This will help you get a snapshot of assets that need to be divided. For clarification on the financial implications, speak to a Certified Divorce Financial Advisor (CDFA™) or a CFP ® (CERTIFIED FINANCIAL PLANNER™). These professionals can help you understand the financial implications of your choices for both the short term and long term. 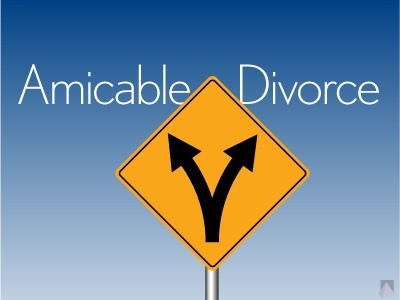 Even when yours is a “friendly” or “amicable” divorce, you are still going through a major life transition. Whether it is a counselor or non-judgmental close friend, make sure you have someone to talk to and can rely on for support. A counselor or therapist may be able to offer coping techniques to help you focus on the larger picture of this transitional time in your life. As a couple you wrote the beginning and middle of your story, and as a couple you can decide what your ending should be. You can do this. Don’t bow to the pressure of family, friends, or the media that tell you how divorce should be. Divorce doesn’t need to be defined by what you’ve heard or what your friends have experienced. Defining your divorce as a couple will allow you to move through one of life’s most difficult transitions with dignity, strength and respect for each other. And that is a successful divorce – the end of one story and the start of another chapter in your life.